The Y&R Update Friday 11/12/10--Canada; Monday 11/15/10--U.S.A.
Daniel goes to the Club to meet Phyllis. She can see he's upset, and thinks it's about the paternity test results, but he says they haven't come in yet. He's not worried about the test, because he's sure Daisy is lying. He's depressed because today would have been his and Amber's anniversary. He was committed to her, and feels bad that they couldn't even make their marriage last a year. Phyllis says having a marriage end doesn't make you a failure, and asks why he's worried about this now. Daniel says he ended things with Amber because he wasn't ready to be a dad, and now he may have already been one at the time. Phyllis gets Daniel to joke about it a bit, but then he tells her that Abby broke up with him. He mentions the karma in Abby leaving him for the same reason he broke up with Amber. Phyllis never thought Abby was right for Daniel, and points out that she left him as soon as one difficult thing happened. At Gloworm, Gloria tells Adam she's happy to have him working there. He spots Skye at the bar, and goes to talk to her, after promising Gloria that they won't make a scene. Adam isn't pleased to see her, as he'd told her to keep her distance. Skye isn't fazed by Adam, and tells him she didn't believe what he said earlier. Skye says that Adam isn't upset with her, but is disappointed because Sharon being taken in by the changes he's made. She says Sharon would never choose him over Nick. Gloria tells Adam she needs him to buy supplies for the restaurant. His driver is gone, but she tells him she'll give him bus fare. Skye is still at the bar, and says she's enjoying seeing Adam's plan backfire. He says his only plan was to get away from her, but she's right; it hasn't worked. Skye says his real plan was to trick Sharon into thinking he rediscovered his true self. She laughs and asks how long he thinks he can keep this up. He starts to get worked up, but catches himself. Skye pulls out $200 to pay for lunch, and tells him to keep the change. Sharon is taken aback by Nick's marriage proposal. He tells her that he loves her, and couldn't stop, even when he tried not to. Sharon knows, but wants to take things more slowly. She thinks that him moving in with her, and Faith is a good start for right now. Sharon wants to be sure that they're doing the right things for the right reason, but is thrilled to be with Nick in the home they shared again. Nick tells her to hold on, and goes upstairs. He comes back down and gives her her old engagement ring from when they were teenagers. He's put it on a chain for her. Nick says that his proposal came from the heart, and Sharon has had his heart for as long as he can remember. He talks about how nervous and excited he was when he gave her that ring the first time. He says they've been down a long, hard road, and unimaginable pain, but their feelings survived, and brought them back together. He reminisces about the time they spent in Paris, and the night they conceived Faith in the cabin. He says Faith embodies everything that he and Sharon are to each other. Sharon is touched, and cries. She then smiles, and slips the ring on her finger, and asks Nick where he found it. He found it years ago, looking for a thermometer to take Noah's temperature. He says it meant a lot to him that she kept it. She says she thinks if she hadn't kept it, she'd have lost a piece of herself. Nick looks into her eyes, and again, asks her to marry him. She smiles and says that she will. They kiss. Nick says that this is what he's always wanted. Sharon says she feels the same way. Nick says he loves her, and they kiss again. He asks if she thinks anyone will be surprised. Sharon says Noah definitely won't. Nick says Phyllis probably won't be, either. Ashley and Tucker are in his office getting ready to go to Abby's birthday party at Victoria's. Ashley asks if Tucker wants to put his name on the gift, but he says he already got Abby something else. Ashley hopes Vance won't be there. She still doesn't approve of the lawsuit. Ashley says Abby wouldn't be suing Victor if not for Victoria and Jack. Ashley feels that she raised Abby to trust her own instincts, and wonders when she'll see the independent side of her again. Abby and Jack are at Victoria's house. Jack and Victoria tell Abby they have a big surprise for her, and tell her that the judge ruled that Victor has to turn over his financial records. Jack says Victor wouldn't have fought so hard not to turn over the records if they didn't prove that he'd mismanaged their trusts. They are thrilled about the victory, but Abby is somber. She asks if Victor knows. Victoria isn't sure. Abby says this wasn't supposed to be about revenge, but Victoria and Jack say it's not revenge; she'll be gaining her independence. Abby asks Jack what he's getting, and he admits that he enjoys outsmarting Victor. He decides to go to Victor's office to see Victor find out he lost the appeal in person, but Victoria says it's not a good idea. Jack tries to reassure Abby; telling her that he knows she's worried, but this had to be done. He promises to protect Abby every step of the way. He wishes her a happy birthday, and leaves. Victoria tells Abby that one day, she'll be glad she set up this boundary with Victor. Abby is afraid that Victor won't want a relationship with her after this. Victoria says that she did everything Victor wanted her to do, and lost her husband and son, as a result, and could have lost Billy as well. Abby is near tears. She thinks it's fine that Victoria took a stand for love, but that's not what it was about for her. Abby wanted to become a success in business just like Victor did, so he'd be proud of her, and instead he's going to disown her. Victoria tries to calm her down, but Abby very upset, and says she wants out of the lawsuit. Abby talks about always being able to count on Victor to remember her, and how he'd always make a big fuss over her birthday in the past. She knew it would be different this year, but thought she might at least get a call. Victoria says she understands, and wants Victor's love too, but it comes at a price. Abby says maybe she's willing to pay that price. She says she knows what it's like to lose a father and sister, and shouldn't have to choose between Victoria and Victor. Victoria says she won't have to choose, and won't lose anyone. She thinks Victor is just lashing out because he lost control of them, but Abby thinks Victor is hurt. Victoria says Victor loves Abby and is missing her, just as much as she misses him. Ashley and Tucker arrive. Victoria has an errand to run, and steps out. Ashley gives Abby her gift. A set of gold bangle bracelets. Tucker's gift is a bag of oats. Abby is confused, until she hears a horse neighing outside, and realizes Tucker bought her horse back. She hugs him, then rushes outside to see it. Inside, Ashley asks Tucker what he was thinking. He's confused and says Ashley says Abby missed it, so he bought it. She blasts him, saying it's way too much, and he shouldn't have done it, and should have asked her first. Tucker thought she'd be happy, and says it was just a small expense for him. Ashley says Tucker has put in her in the position of having to ruin Abby's birthday, because she won't let her accept such an extravagant gift from him. Abby is on her way back inside, when Daniel arrives with a gift from her. They talk about the horse, ad she tell him it's a gift from Tucker, and thinks it's a little weird that he gave it to her. Daniel doesn't want her to beat herself up for breaking things off. He says he's bad at long term commitment, and thinks she did the right thing, even if the baby isn't his. Abby says okay, and invites him in. He's waiting on the paternity test results, and can't stay. He leaves. At Newman Enterprises, a woman rushes up to Victor as he walks in, telling him that she tried to stop 'them.' Victor is confused, until Vance and two other people walk out pushing a cart full of papers. Vance tells Victor that his appeal was denied. Victor tells Vance that he won't allow him to take the records out of the building, because they're full of proprietary information. He sends his employee to call security. Vance says that if Victor tries to stop him, he'll be arrested, and have to turn over the records anyway. Victor calls Michael for help. He tells him that it will be catastrophic for NE if the records end up in the hands of Jack and the other competition. There's nothing Michael can do. Victor angrily tells Vance to take the records and get out. As Vance and the others leave, Jack walks in and smiles smugly at Victor. He pretends to be there about something else, but Victor tells Jack he knows he was behind the lawsuit. Jack admits it, and says he wanted to be there to see the payoff. 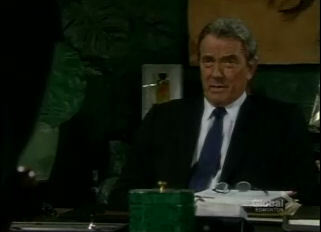 Victor walks into his office, with Jack following. Jack says he never could have convinced Victoria and Abby to stick with the lawsuit if not for Victor's manipulative behavior. Victor is appalled that Jack would boast about ripping apart his family. Jack says that the girls are his family too, and he's proud that he helped them see the truth. Victor accuses Jack of using them to get to him. Jack crows about Victor wanting to take him down, but not being able to because he needs his help destroying Adam and the Newman Fund. Victor says that chapter is finished, and vows to get back at Jack. After Jack is gone, Victor sits alone in his office, and tells someone on the phone that the company has not been raided, and tells them to clear up that rumor. Victoria walks in. Victor thinks she's there to gloat, but she says she's not there about anything they've been fighting over. She tells him that it's Abby's birthday, and she'd appreciate it if he called. Victor says he knows it's Abby's birthday. He then rails at Victoria and tells her that the company is in chaos, the investors are panicked, and the competition has a chance to profit, and it's all because of her. Victoria says it's too late to repair the relationship that she and Victor had, but it's not too late for him and Abby to fix their relationship. She says that Abby is depressed and missing him, Brad and Colleen, and they could show her that she's not alone. Victoria yells at Victor and asks if it's too much for him to say 'happy birthday' to her. Victor calmly tells her to get out of his office, and she leaves. Abby goes back inside, and Ashley and Tucker can tell she's upset. She explains that Daniel came by, but wouldn't come inside. She guesses it was for the best. Tucker apologizes if his gift made her uncomfortable, and Ashley starts to tell her that she can't accept it, but she says that the gift was just what she needed. Victoria comes in, and hands Abby a gift. Before she can open it, Victor arrives. Abby beams. He asks about the horse, and says he thought she sold it. Abby tells him that Tucker bought it back, and she's glad to have it, because Victor bought it for her, and she sees it as a symbol of his love. Victor says she traded the symbol of his love for money, and suggests that it's similar to what she's doing now. He turns and leaves. Nick sets up a meeting with Phyllis at the Club, and goes to see her. He tells her that he has something to say that he wants her to hear from him. She thinks it might be something she can write a story on, but he tells her that and Sharon are engaged. Phyllis doesn't show much of a reaction, beyond smiling a bit. She asks how he's going to tell Summer, and Nick says he'd hope they could do it together, and make sure she wasn't confused. Phyllis says she thinks Nick can handle it on his own. She says she needs to go to the office, and is sure Nick has other people to tell. Nick seems concerned, and says he hopes she understands. Phyllis says she understands completely, and doesn't need him to explain anything. Nick asks if they can talk later, and she says yes. He leaves. Once he's gone, Phyllis seems like she's in shock. Jack walks by, and says hi. Phyllis lets out a loud sigh. She says that she knew Nick and Sharon would get married ever since she found out Faith was still alive. It proves she's not crazy or paranoid, the way Nick tried to make her feel. She should feel relieved and vindicated, and glad not to have to hear Nick deny that Sharon is the love of his life. Jack knows she's hurt, and says he's sorry. Phyllis says she was okay when she got the divorce papers, but Jack says that this is different. Phyllis tells Jack she misses him. He says that her emotions are running high, and it's not the right time to have this discussion. Daniel walks up, and tells Phyllis that the test results are in. Sharon as at Crimson Lights, talking to Faith's nanny, when Adam walks over, and says hi to her. She asks how he is, and he says he's better after seeing her, and hoped he'd run into her, because he thought their conversation the other day wasn't finished. Sharon starts try and find the words to tell Adam she's engaged, but before she can, he guess that Nick proposed to her. Sharon seems sympathetic toward Adam and says it must be hard to hear that, but he tells her that it makes sense, and he can tell that she's happy. He says he understands that she'd want to raise Faith in a family with her father. Sharon agrees that she does want that. Adam doesn't like Nick, but is sure that he appreciates what he has with Sharon. Adam wishes her the best, and tells her that she can't go wrong when she goes with her heart. Sharon thanks him, and he leaves. Adam goes back to Gloworm with Gloria's supplies. She's on her way to pick up Fen, and starts to talk to him, but Adam says he's quitting the job. She tries to talk him out of it, but he says it's not for him, and leaves. At home, Sharon listens to Faith on the baby monitor. Nick asks if she's awake, but Sharon says the baby was just moving in her sleep. She and Nick talk about telling their exes the news. Nick says Phyllis handled it well. Sharon tells him that she ran into Adam, and he also handled things well. Nick starts to talk about what Adam would have said if he was there, but Sharon doesn't want to talk about him. They cuddle on the couch, and play with her ring. Sharon says it reminds her of their high school days. Nick agrees, but says this time, he's not nervous, just excited. Sharon says her too. She repeats Adam's words and says it can't go wrong if they follow their hearts. Nick says that he's glad his heart lead him back to her. Sharon seems to have something else on her mind. Adam goes to Skye's room. She says she knew he'd come back. Adam says he'll only stay if there's no more blackmail. He wants to be partners just like in the old days. They kiss passionately. He says he's ready to make some money. Skye tells him she's glad he's home.